HOME /Blog /UGears Trimaran Merihobus – get into the maritime spirit! UGears Trimaran Merihobus – get into the maritime spirit! 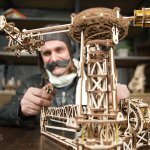 UGears company continues to deliver joyous moments to the 3-d puzzles and wooden models enthusiasts all over the world. 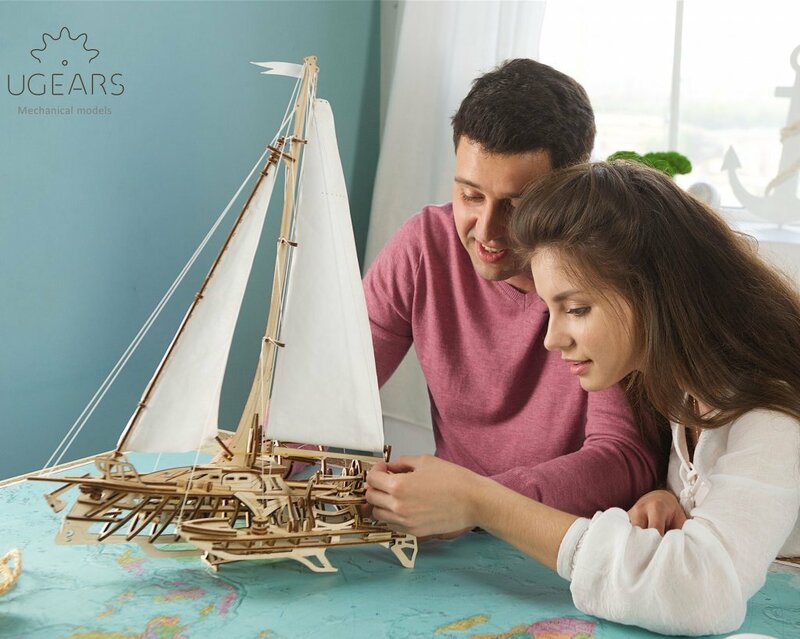 Introducing UGears newest 3-d puzzle, Trimaran Merihobus, the most exciting model of a sailing yacht to date! UGears Trimaran Merihobus consists of 237 pieces and requires anywhere from 9 to 16 hours for assembly. Just like all UGears 3-d puzzles, the Trimaran is made with high-grade natural wood materials and assembles on the principles of jigsaw puzzles, without the use of any glue. This new model’s unique “skeleton”-like design provides an excellent view of the work of its internal mechanisms in great details. How does UGears Trimaran Merihobus work? Exquisitely designed UGears Merihobus, though primarily created as a display model, can be used in many other ways. Because Merihobus features elements that produce real motion, it is ideal to play with and to practice your sailing skills. Let’s take a closer look at this boat and explore its self-propelled sailing mechanisms. The sails are made of real white fabric and can be set or taken down, depending on the wind condition and the tide. The sail booms are operated with a lever that pulls the sheet of the boom. The angle of the sail is adjusted by the steering wheels controllers, located in the back of side regulators. When your marine adventure comes to an end, drop the Merihobus Trimaran anchor using its automatic-tensioning mechanism, located inside the boat’s body. This model also features rescue lifeboats with on-load releasing mechanisms that are located on the side of the yacht’s body. Thin rope threads hold the lifeboats in hanging position, fully prepared for landing on an uninhabited island. The Trimaran Merihobus unique and stylish design. The Trimaran is made with high-grade natural wood materials and features a traditional for all UGears mechanical models signature design. A bow of the boat is decorated with a delicate carving of a seahorse. This curious tiny sea creature, also known by the name “Merihobus”, gave the UGears Trimaran its name. Additional bonus feature of this model is a set of templates that allow you to create your own customized flag for your boat to flow on the Trimaran’s mast pole. 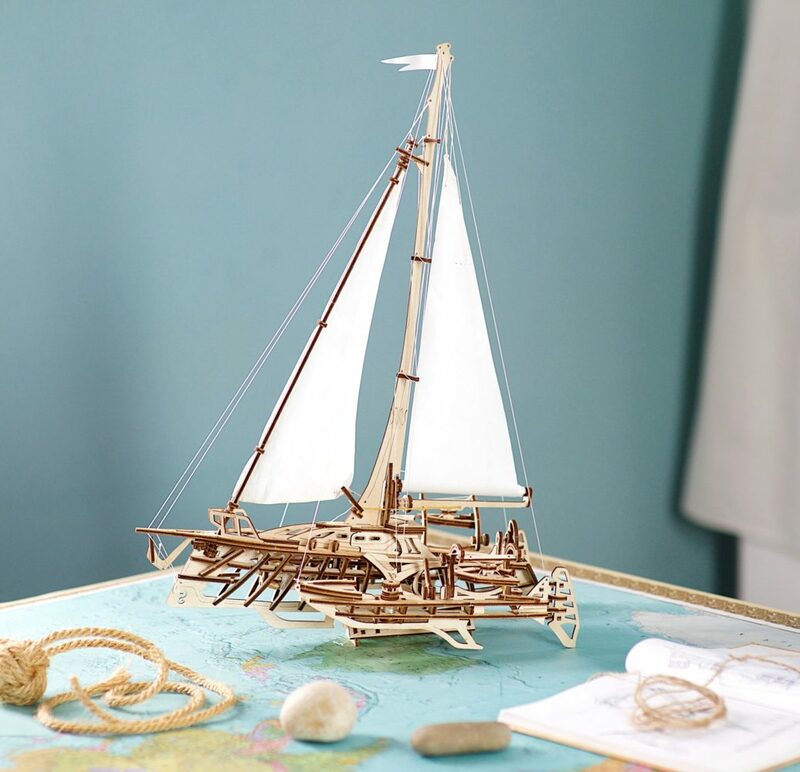 All the special features of this model, such as its unique and original design and the ability to produces real motion, make UGears Trimaran Merihobus an ideal gift and eye-catching decor item. You can order your own UGears Trimaran Merihobus from our online catalog.